Some dear friends bought us an Instant Pot as a thank you gift. Immediately, I thought: cholent. The Instant Pot is an electric pressure cooker that also allows you, with the touch of a button, to sauté, slow cook and keep warm. Before you leave for work you can dump ingredients into it and come home to a fresh, hot, slow-cooked meal. Before bed you can fill it with oatmeal and water and wake up to porridge. The killer app, though, is the pressure cooker function: With the touch of a button, you can cook dishes that take hours – bone broths, short ribs, dry beans – in 30 minutes. Our friends are young and busy and, with a first baby on the way, about to get unimaginably busier. For them the Instant Pot is a savior. For years my “Instant Pot” has been a Le Creuset Dutch oven, cast iron coated in orange enamel. It works over the gas flame, on a fireplace grate, in the oven. When it’s full and I need to move it, that’s my upper body workout for the day. Years ago I saw it all shiny and new and relatively inexpensive at Costco. Immediately, I thought: cholent. Cholent is a Sabbath stew that Jews would traditionally make on Friday then keep warm in a low oven all night, so they could eat it Saturday, when all manner of work, including heating food, is forbidden. Every Jewish culture developed a version of this one dish meal. It probably started with dafina and hamin, the Sephardic versions, then migrated north, through France and into Germany and Eastern Europe. Cholent comes from the French word chaud, or warm. There’s even some conjecture that the Sephardic Jews who settled in the American Colonies brought the hamin tradition with them. Their non-Jewish neighbors adapted it, adding pork and molasses, and the Sabbath stew became Boston baked beans. Dafina and hamin use rice and chicken and warm spices. Cholent uses barley, beans and beef. They all make you want to eat, then nap. I like cholent in the winter. The smell of slow-cooked meat and beans seeps out of the oven during the night. On Saturday morning, when your mind tries to drag you back into the week, back to all the horrible news and the WTF craziness of it all, that smell suffuses every room, to remind you it’s the Sabbath, to tell you to take a deep breath, a break. By the time lunch rolls around, you actually have an appetite to match the meal. Last week, to test, I made two cholents. I wanted to see if the the Instant Pot would give off the same powerful Ashkenazi incense? I wondered: Could such a newfangled appliance master an ancient dish? The process was simple and fair. I put chunks of vegetables, seared beef neck bones, uncooked barley, uncooked garbanzo beans, and more vegetables into each container, then poured chicken broth goosed with some smoked paprika, salt, pepper and cumin over it all. 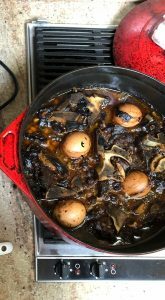 My favorite part of dafina and cholent is the whole egg that cooks for hours inside the stew. The whites turn creamy, soft and brown as the fraction of sugar naturally found in them caramelizes. The Sephardics call these huevos haminados, hamin eggs I put the eggs in the Le Creuset before placing the pot in a 225 degree oven. 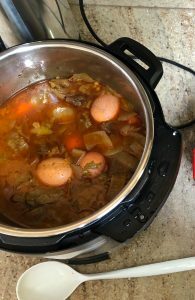 The Instant Pot cholent was done after 40 minutes of pressure cooking. I let out the steam, lifted the lid, added the eggs, then closed it up and clicked the “Keep Warm” button. The eggs, which would have turned into a really messy science experiment under pressure, would cook in the residual heat. On Saturday afternoon, I pulled the cholent from the oven and lifted the lid on the Instant Pot. Both were completely cooked: the beans, vegetables and grains soft, the meat falling off the bones, the broths infused with flavor. Otherwise, it wasn’t a close call. The oven cholent had formed a thin dark brown crust from evaporation. The flavors had concentrated, the meats and vegetables took on even deeper color. The eggs had turned soft and tan as well, like they’re supposed to. The broth was more concentrated and fragrant. It was sensational. The Instant Pot cholent was, well, soup. Nothing had evaporated. Time had not worked its magic. The pressure cooker had cooked it all, but that was all. Flavors hadn’t developed beyond “cooked.” It was good because the ingredients and recipe were good. But it was no cholent. My wife and I talked over the problem during lunch. 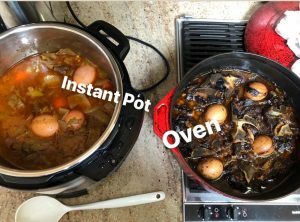 Instant Pot promises faster cooking, but cholent is supposed to be cooked slowly. Some liquid needs to fragrance the air, some steam has to escape to the oven. An Instant Pot is great at making cholent fast, but then you get fast cholent. “That’s an inherent contradiction,” I said to my wife. Our culture wants us to believe speed is better. And sometimes it is. When work and home and other obligations pile up, it’s nice to be able to cook your beans in twenty minutes. But we have to remind ourselves that fast isn’t automatically better. Sometimes, it’s just worse. I adjust this recipe depending on what vegetables and meats I have handy. This also works well without meat, just increase the amounts of beans, vegetables and grains. Also, I use Sephardic spices in my basically Ashkenazi cholent. So sue me. Chop all the vegetables coarsely. Heat some olive oil in the bottom of a heavy Dutch oven. Sear the meat bones until brown on each side. Remove. Add half of the vegetables. Layer in the meat. Sprinkle over the beans, rice, herbs and spices. Add the stock and/or water until it comes almost to the top of the ingredients. Cover and bring to boil. Remove from heat and place in a preheated 225 degree oven. Let cook overnight. Check once or twice to make sure water hasn’t evaporated, adding more if necessary.